If you hadn't read the heading for today's post, would the image on the left evoke the words "Pony Express"? The answer is probably yes. The Pony Express was short-lived (April 3, 1860-October 24, 1861), but the image of a lone rider chasing across the vast expanse of the West is forever engraved on the minds of history lovers. 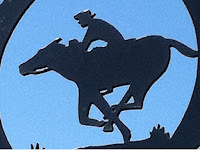 Inspired at least in part by concerns in Washington over the need to keep the western states in the Union, the Pony Express captured the imagination of the nation. At a time when the fastest mail to California took weeks to arrive from the East, the idea that mail could leave St. Joseph, Missouri, on April 2 and arrive in California by April 12 seemed preposterous. Until it happened. The freighting firm of Russell, Majors, and Waddell proposed the express. In 1859, they'd formed the Leavenworth & Pikes Peak Express Company and sent men out to build and establish stations along a central route to Colorado. In the early months of 1860, the country was consumed by the crisis that would become the Civil War. One of the major concerns was that the western states remain in the Union. Rusell, Majors, and Waddell, set out to establish a "pony express mail service" from St. Joseph, Missouri, to Sacramento, California. Why St. Joseph? It was connected to the east by railroads and the telegraph. The Pony Express promised the impossible--mail delivery from St. Joe to Sacramento in ten days. Once hired on, riders stayed at the luxurious Patee House Hotel in St. Joseph, Missouri, while they waited to leave for their assignments. At the Patee House, they were invited to the balls, allowed to wear their spurs (no matter they scratched the ball room floor), and generally treated like celebrities. Each rider carried the mail approximately 100 miles (depending on the terrain) and were allowed 2 minutes to change ponies at the stations along the way. At the outset, each was given a horn to blow as he approached a station, but it wasn't long before everyone realized the horns weren't really needed. Station keepers could hear the hoof-beats as well as a horn. The route followed heavily trafficked trails, and during spring and summer riders often had to "share the road" with emigrants heading west. Sometimes they even had to cut off the trail in order to avoid having to slow down because the trail was so crowded. In winter, westward travel stopped. Riders experienced harrowing storms, blizzards, "cyclones," and floods. And they kept going. To enhance speed, a special lightweight saddle was designed. When a rider changed horses, he didn't have to switch the entire saddle. He merely removed the leather cover called a mochila, which featured four locking mail pockets, one in each corner. Mail was wrapped tightly in oiled silk to keep it dry during wet weather and stream crossings. The key to success was good horses, and the Express purchased "good Kentucky stock" for the eastern part of the route. The animals were hardy, surefooted, swift, reliable ... and sometimes half wild. It was expected that riders would be able to outrun Indians intent on causing trouble. Well known to the riders were Black Billy, who arrived at a station with an arrow in his flank and one in his shoulder and American Boy, who once took off without his rider and ran all the way to the next station on his own. Every neck is stretched further, and every eye strained wider. Away across the endless dead level of the prairie a black speck appears against the sky, and it is plain that it moves. Well, I should think so! In a second it becomes a horse and rider, rising and falling, rising and falling—sweeping towards us nearer and nearer—growing more and more distinct, more and more sharply defined—nearer and still nearer, and the flutter of the hoofs comes faintly to the ear—another instant a whoop and a hurrah from our upper deck, a wave of the rider’s hand, but no reply, and man and horse burst past our excited faces, and go swinging away like a belated fragment of a storm! While the Pony Express was short lived (April 3, 1860-October 24, 1861), the daring of the men involved in the venture has never been forgotten. What individuals from the West do you particularly admire? Why? 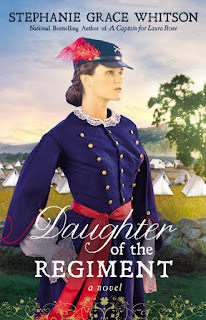 release, Daughter of the Regiment, was named one of the five top inspirational novels of 2015 by Library Journal.